Bath Township police are investigating a bizarre and disturbing break-in at a local doctor's office. The strange part? The crooks didn't take anything. What they did do, according to police, was bust in and perform some sort of medical procedure. Bath Township police chief Mike McNeely said he's never seen a case quite this bizarre. It leaves a lot of unanswered questions, including who is the suspect and the patient? "Really have no idea and that's what we're trying to get to the bottom of," McNeely said. 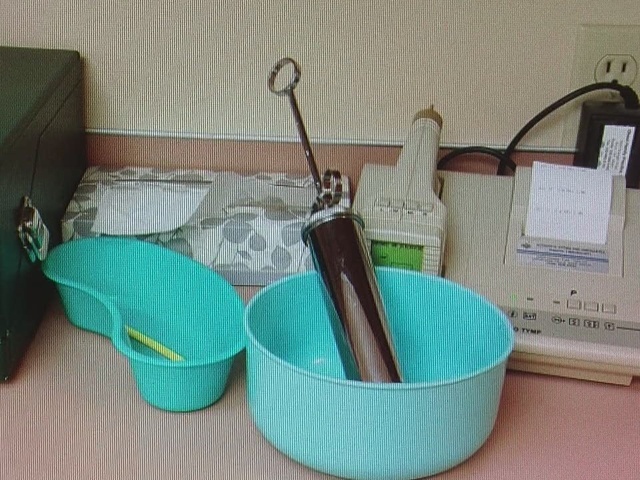 Police took photographs of machines and other medical equipment that was apparently used during a medical procedure at University Hospitals Ghent Family Practice. Instruments were left in bowls. A surgical glove was tossed in the trash, along with medication wrappings. Even a purple gown was left on a table. It's very bizarre because I've never seen anybody break into a place to perform a medical procedure," said McNeely. Based on the machines and instruments used, Chief McNeely believes the procedure was performed on an ear. He says whoever broke in disabled an alarm on Oct. 10 or Oct. 11. None of the employees were at the practice during that timeframe, police were told. "You would certainly be concerned about the person the procedure was performed on," said McNeely. "Were there sterile instruments used? Was it performed properly?" Carolyn Leibowitz called the situation scary. She owns Coquette Boutique across the street. "It macabre," she said. "How's that? It's a good word. It just is right out of screen play." UH’s Ghent Family Practice management team learned earlier this month about unauthorized access to the practice facility. This was reported to the Bath Township Police. The police along with UH management are investigating what happened during this incident; there is no confirmation at the moment about misuse of equipment or supplies. The safety of our patients and employees is a high priority for UH. UH is cooperating fully with local authorities to learn more and ensure the safety of this practice. Police say, at the least, the crime was breaking and entering, but more charges could be filed is suspects are identified. "I would assume that there's some some type of charge out there for performing a medical operation by an unlicensed person, but that's beyond what we're looking at right now, McNeely said. "We're just trying to determine who the suspect is."